Allotment of exam center while applying for SSC CGL is done by taking applicant’s Choice of order. Applicants need to provide a choice of three cities as their SSC CGL Exam Centers. These three cities or centers need to follow specific order of preference; first needs to be the nearest and easily commuted, second can be a neighbor city and third needs to be any other city which can be commuted on time. One need to pick three cities out of 105 cities. All three cities needs to follow order of preference with first being the nearest. Other choices of SSC CGL Exam Centers also need easy to commute. Allotment of Exam Centers will be on first come first serve basis. Candidates need to provide a choice of three cities as their SSC CGL exam centers in the application form. All three Exam centers are to be provided in the candidate’s order of preference. The first preferred city should be easy to travel to write the exam. Total seats for the city of your first choice have already been filled. Exam center has been cancelled. candidates are advised to complete their SSC CGL 2019 Application process at the earliest as the exam centers are allotted by SSC on a first come first serve basis. This may guarantee that they get the city of their first choice. Once the exam center is allotted to an applicant, he/she needs to take care of certain things in the examination hall/center. SSC strictly instructs a specific dress code during the conduction of SSC CGL Examination. Both male & Female candidates need to follow below mentioned dress code in order to avoid suspension of candidature from SSC CGL 2018-2019. Male Candidates are advised to Wear light coloured shirt/ t-shirt half sleeves with small buttons. Any traditional wear like kurta or pyjama is not allowed. Female Candidates are advised to wear Light coloured, half sleeves kurtas or tops, with small buttons. No brooch, flowers, bangles, jewellery, etc are allowed during the exam. Women are not allowed to wear any kind of jewellery except Mangal Sutra. Salwar’s, Patiala’s, and plain simple lowers cannot be worn. Only Jeans or Leggings/ Jeggings can be worn. 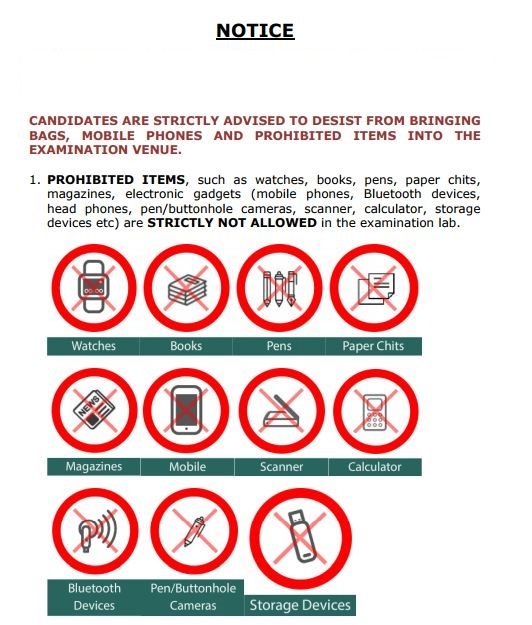 Candidates are not allowed to posses following list of items during the exam. If found any, applicants may be asked to leave the examination hall. Stationary item such as bits of papers, textual material (written or printed), Pencil box/ Geometry, Plastic Pouch, Pen, Calculator, Scale, Pen Drive, Writing Pad, Eraser, Log Table, Calculator, Scanner/ Electronic Pen etc. Watch/Wrist Watch, Camera, Bracelet, etc. Communication devices such as Bluetooth, Mobile Phone, Earphones, Pager, Microphone, Health Band etc. Items such as Goggles, Wallet, Handbags, Cap, Belt etc. Food items either opened or closed are not allowed. Metallic item such as knife are strictly prohibited. ⇒Check Official SSC Notice regarding prohibited items during SSC CGL Examination. Hope You liked this Post on SSC CGL Exam Centers. If You have any Query or Suggestion, Do write us in the comments below.